If you get your garden ready for winter properly, it will make a big difference next spring. Instead of playing catch-up and fixing winter’s damage, you’ll be ready to enjoy your garden when the first spring bulbs come up. Use the checklist below to help with the late fall jobs around the yard and garden. Protect young trees with guards: Put plastic or wire mesh (hardware cloth) tree guards around the slender trunks of any new trees and shrubs to protect them from gnawers such as rabbits and mice, and make sure the tree guards go high enough, over the snow line. Continue to water trees, especially evergreens, until the ground freezes. Evergreens need a good store of moisture going into winter because they don’t lose their leaves, which means they continue to transpire (give off water vapor) through the cold months. More information on winter care for your trees and shrubs. Use your yard’s leaves: Consider shredding fall leaves and using them as winter mulch on flower beds. You can also add shredded leaves to the compost pile. In a season or so, they’ll make the best treat your garden soil can have. You can use a chipper shredder, if you have one, or just run your lawn mower over the leaves. Read more about easier ways to clean up fall leaves. Clean up fallen leaves from your lawn each week instead of leaving the job until all the leaves have fallen. In fall, lawn grass still needs sunlight as it is creating sugars to store in its root system for good growth next spring. Leaving the leaves on top of the lawn can smother the grass and weaken it. However, there is an easier way than raking to deal with leaves on your lawn: just chop them up with your mower, and leave them on the grass to break down. You will probably have to run over them a couple of times. Research at Michigan State University has found that turf grass benefits from chopped up leaves left on the lawn instead of being raked off. Control lawn weeds: If you spray your lawn to control broadleaf weeds, the month of October is the most effective time for this job. Apply lawn fertilizer. A lawn fertilizer application made in the late fall encourages increases winter hardiness and promotes quick greening in spring. For more information on this, see low maintenance lawn care. Cut the lawn one final time: After you are finished, why not get your mower serviced and its blade sharpened now so it will be ready for spring? Weeding: Do one last weeding and discard any weeds that have seeds on them in the garbage instead of the compost. You don’t want those pesky seeds sprouting in your garden later. Perennial garden cleanup: Whether you cut down dying perennial foliage when you’re getting the garden ready for winter is up to you. Some gardeners like to leave seed heads and dried foliage for winter interest and to feed birds. Others prefer to leave neat beds ready for a show of spring-flowering bulbs. But whatever you cut down now, you don’t have to clean up in the spring. 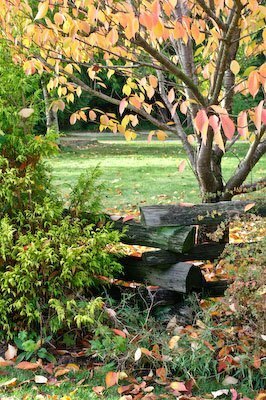 A good compromise when getting your garden ready for winter is to remove leaves and stalks that frost turns to mush and any that are diseased, but keep some ornamental grasses and the perennials with seed heads that provide winter food to birds. When cutting plants down, prune perennials to 4 to 5 inches of the ground. Annuals: Pull out any last frosted annuals and add spent plant material to your compost. Weeding and edging: Do a final weeding and edging of flower beds. Spring bulbs: This is still a good time to plant spring-flowering bulbs before the ground freezes hard. Rose care: Don’t cut roses back now – do it early spring. Hill up hybrid tea roses with soil for winter protection if necessary. More tips on protecting roses over the winter. Winter mulch: Once the ground freezes, apply a layer of winter mulch to perennial beds – don’t do this too early or you’ll provide winter shelter for rodents.